Monarch butterflies are still visiting the milkweed plants every day. This morning I went out to look at the plants and was surprised to see caterpillars on them. Monarch butterfly from four weeks ago. Monarch caterpillars as of today. Monarch caterpillar as of today. I hope these caterpillars will transform into pupa (chrysalis) and after that become the next generation of Monarch butterflies. I remember seeing them surprisingly late, too, when I lived in and around NYC. I think they still have time – and just think, since they can’t migrate yet, they won’t be caught up in the storm (Florence). Lynn, the birds ate all the caterpillars a day or two after they first made their appearance on the plants. Next year I will put a net around the plants to prevent that from happening. Ouch! That is so disappointing. But it’s a great idea to put a net over the plants – I hope the monarchs lay eggs there again! All the signs summer is ending, but they do make lovely caterpillars! Thanks Donna! As of today the caterpillars are gone, and I see no pupa. I am afraid the birds ate them. Surprising to see caterpillars and butterflies at the same time! Brilliant photos Hien. The details are incredible! Sue, there are 4 generations of Monarch butterflies each year. It is possible that caterpillars overlap with butterflies from the previous generation. Oh I had not realized that. Thanks for the information! Incredibly captured! I haven’t seen many monarchs this year. 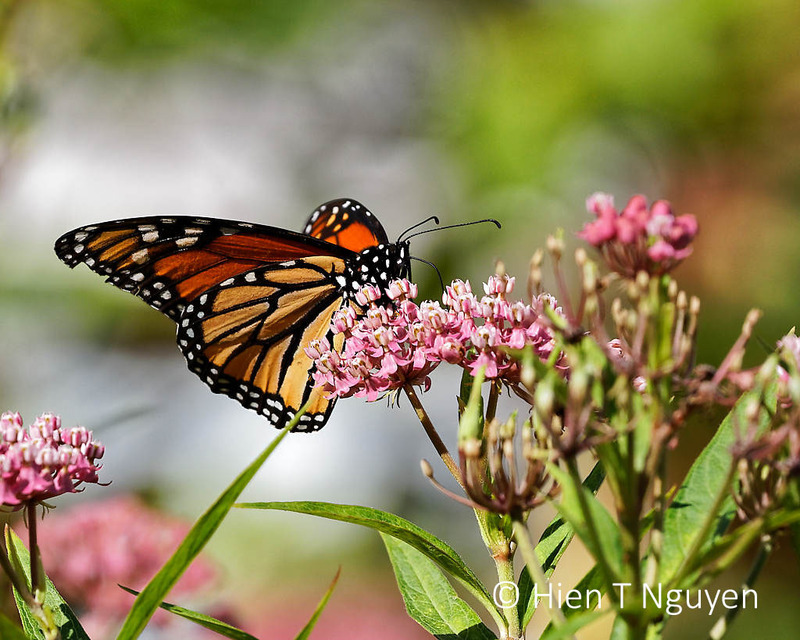 Stunning photographs, Hien! I’ve always been fascinated by this remarkable transformation. Nature is amazing! Thanks Celia! Are there these kinds of butterflies in Japan? I love that the caterpillars are using the same colour theme as the butterfly – it’s like the are from the “Monarch” range. Great photos. Thank you Emma! Each kind of butterfly produces caterpillars that generally follow the same color theme as the parents. Monarch caterpillars are very noticeable, perhaps because we like them. I heard there are places in Mexico that used to have millions of these Monarchs, a sight to behold. Monarch butterflies are very special. 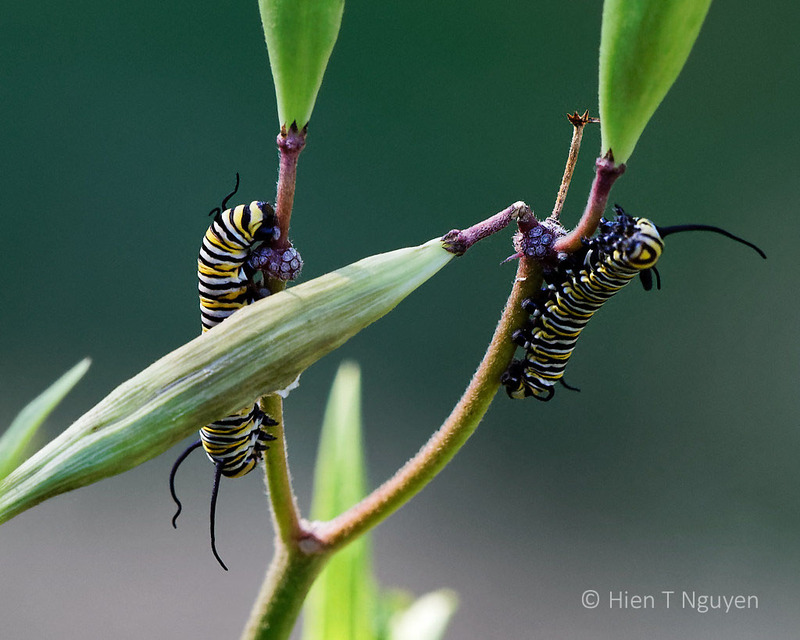 Beautiful images of beautiful subjects, Hien! I hope you’ll be able to show us the chrysalis as well. Thank you Dries! I will try to photograph the chrysalis, hopefully before the birds eat the caterpillars. Check in you “spam” folder in your email account. Sometimes, when you delete an email, you could have clicked on the spam button instead, and from then on all the emails from that sender go to spam automatically. 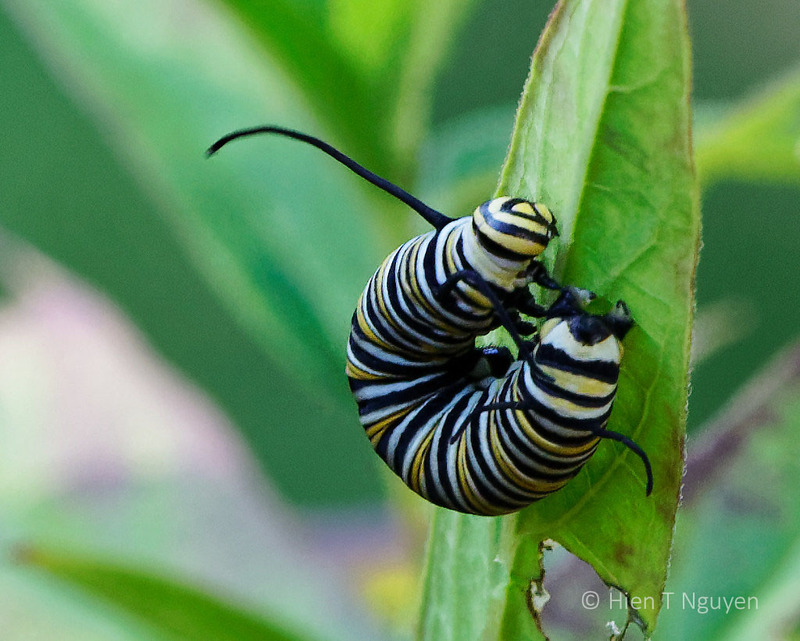 I’m glad that some one is seeing monarch caterpillars and photographing them so well! I seldom see the caterpillars even though the adults are very common here, they have to be coming from somewhere. If you see butterflies every year, their caterpillars are probably somewhere around. Maybe you haven’t had time to look for them. The caterpillars and the butterflies are both so pretty! It reminds me of how I used to find Monarch caterpillars on this big tree in my step mom’s front yard all the time. Lovely photos! Thank you! I’m glad these caterpillars brought back some memories for you. 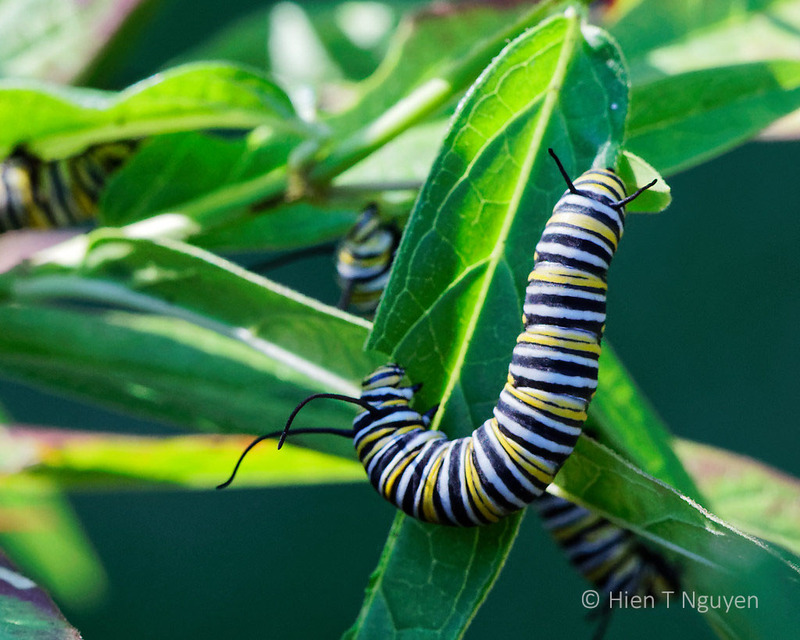 Glad you are seeing Monarch caterpillars….they have been scarce here. Perhaps the hot weather has sent them somewhere else. Ow wow! Such great photos. I have never seen any of them in real. Thanks for the share! As always, nature is a mystery. I would have never imagined the monarch butterflies in the form of such beautiful caterpillars; though the monarchs deserve the beauty in their own right. Awesome photos. Appreciate the share. This is fantastic! Will there be enough leaves for them or will you have to supplement with leaves in jars of water from the wild? They are mature at about 3″ and look for horizontal surfaces to pupate, so maybe a few branches stuck in the ground might encourage them. Good luck on hatching your brood! This is only one milkweed plant, and there are several more on both sides of it, each with many leaves still intact. If not, I will follow your suggestion and stick some branches in the ground. Thanks Eliza!